Brown rice is also called 'unpolished rice' and is brown in color.Brown rice has a mild nutty flavor, is chewier and offer more nutrition than the white rice. Only the outermost layer of a grain of rice (husk) is removed to produce brown rice, while the subsequent layers underneath the husk that contains several vitamins and fiber are removed and polished further to produce white rice. Brown rice is a good source of various essential nutrients like energy, carbohydrate, dietary fiber, B vitamins and minerals like manganese, selenium, magnesium, zinc, folate, iron etc. One cup of brown rice gives 3.5 grams of fiber while the same amount of white rice gives less than 1 gram of fiber. Health experts and Nutritionists are now increasingly recommending brown rice as an excellent source of all-round nutrition. 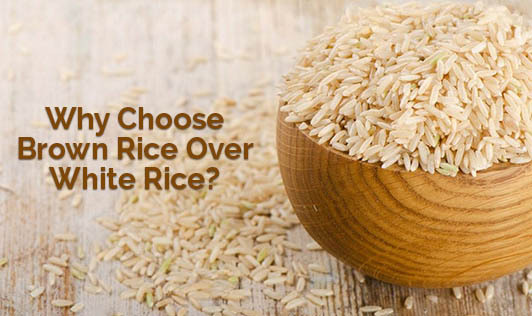 As for the health conscious people, brown rice would be the obvious choice as many health benefits of brown rice have been proved. Brown rice has a low glycemic index than white rice which helps to prevent the sugar spikes in diabetics. Study has shown that people who consume at least 2 servings of brown rice per week reduced the risk of developing Type 2 diabetes. It has been shown to lower the risk of total cholesterol and LDL level. It helps the individuals to keep a check on their weight, since the brown rice can make them feel full, which in turn make them to eat less. It can help to protect the body against certain cancers, as it contains antioxidants like selenium and zinc and fiber. It has also shown to reduce the risk of cardio vascular disease and stroke. For all the health benefits, the brown rice is good. And don't forget to make this delicious, nutty-flavored grain a frequent addition to your meals!